Our theory is to create long term relationships with our customers based on gaining the best understanding of their business needs. We invest a significant proportion of time early on in a project to get to know our client better. Vedams has developed a way to enable the efficient and successful delivery of enterprise-scale projects using Agile Methodology. Agile approaches are based on iterative and incremental development that focus on client collaboration. The client has opportunity to provide feedback to make sure that you get the end results that you want. 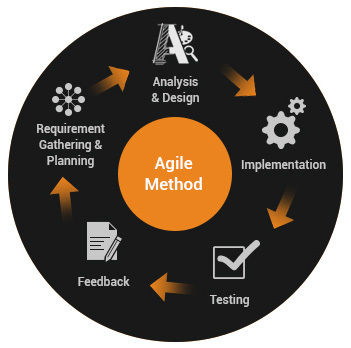 Using “Agile” process methodologies, Vedams rapidly responds to critical customer situations and provides high quality results. The use of Agile detects any potential issues related to the project at the very early stage. As a result, it minimizes the risk of exceeding the budget and missing deadlines. It works well with the clients own strategy for current product engineering.